Persephone was the Queen of the Underworld in Greek mythology, for Persephone was a Greek goddess and the wife of the powerful god Hades. It is hard to imagine more exalted parentage for the goddess Persephone than the one she had, for Persephone was the daughter of Zeus and Demeter, both Olympian deities. Zeus of course had many children, both mortal and immortal, by many different women, but Persephone was the only child born to the goddess Demeter, which is an important factor in the mythology of both Demeter and Persephone. The exalted parentage of Persephone did not make her one of the 12 Olympians, although many of her half-siblings did receive the accolade. Persephone would grow up to be a beautiful goddess, and as a result Persephone was also known as Core, the Maiden. 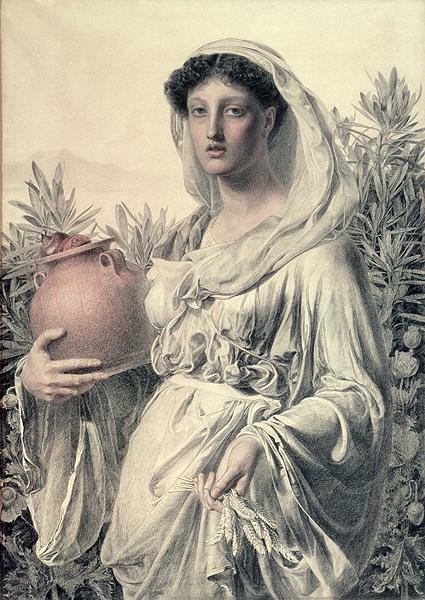 Persephone would spend much of time interacting with nature, planting and nurturing flowers and plants, with her attendants, some Naiad nymphs. The beauty of Persephone would soon attract many of the male members of the Greek pantheon, and it was said that Olympian gods, including Apollo, Ares, Hephaestus and Hermes, all made advances towards the daughter of Zeus. Persephone would reject all of the potential suitors, and Persephone’s mother, Demeter, was powerful enough to ensure that Persephone’s wishes were respected by all. There was one god though, who was not put off by Demeter’s protection of Persephone, and that god was Hades, Demeter’s brother. After the Titanomachy Hades had been given dominion over the Underworld, but the god now had a desire for a worthy consort. Some tell of Hades complaining to his brother Zeus, and Zeus suggesting Persephone as a worthy wife, whilst others tell of Hades simply setting his attention upon the goddess. In either case, Hades ascended from his realm, and at a time when Persephone had become separated from her attendants, Hades struck, abducting his niece, and returning once again to his realm. Most regions of Ancient Greece laid claim to being the place of the abduction of Persephone, and the location where Hades descended into the Underworld with his prize, and various sources name Sicily, Attica, Argolis and Arcadia as prominent possibilities. The disappearance of Persephone caused much angst to Demeter, for it was a disappearance, for it initially seemed that the abduction had gone unwitnessed. Demeter would transform the Sirens, the attendants of Persephone, giving them wings, to aid the search for Persephone, and possibly deformed them as well, if Demeter was angry at them for not stopping the abduction. Demeter herself would wander the earth searching for her daughter, and as she did so she neglected her work, and the world starved. Eventually, Helios, the god of the sun, who observes everything, told Demeter of Hades abduction of Persephone. This news did little to comfort Demeter, for Hades was all powerful in his realm, and she could do nothing to force her brother to give her daughter up. As the world continued to starve, Zeus was forced to intervene. Zeus dispatched his son Hermes, who was also a Greek psychopomp, to intercede with Hades, and gain the release of Persephone. Hades met with Hermes and listened to the words of the messenger god. Zeus had little ability to force Hades to act, but nevertheless, Hades recognised that he could not simply refuse Zeus’ request. At the same time, Hades had no wish to give up Persephone completely. Hades therefore tricked Persephone into consuming pomegranate seeds; the consumption of food in the Underworld bound the eater to that realm. It was said that Persephone ate either three, four or six pomegranate seeds, thus Persephone was bound to spend, three, four or six months with Hades in his realm, as his wife. For the time that Persephone was not bound to Hades, she was free to return to the earth’s surface, where she would be reunited with her mother. 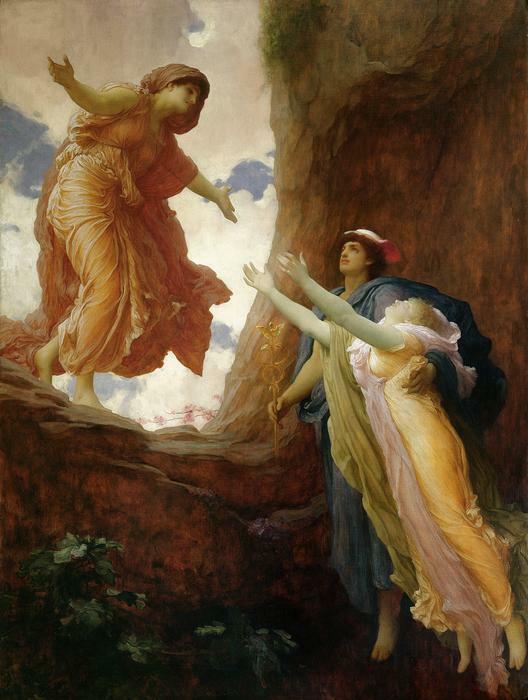 The separation and reunification of Persephone with Demeter would be the reason behind the growing seasons, for when mother and daughter were separated, Demeter would mourn, and nothing would grow, thus winter, and when reunited it would be spring and summer. Thus, Persephone would be an important agricultural goddess to the Ancient Greeks, with many sanctuaries dedicated to the goddess, in the hope of bountiful harvests. Today, Persephone is better known as the Queen, or Goddess, of the Underworld, rather than as an agricultural goddess, and surviving tales of Persephone see her in the realm of her husband, and show both her benevolence and her wrath. 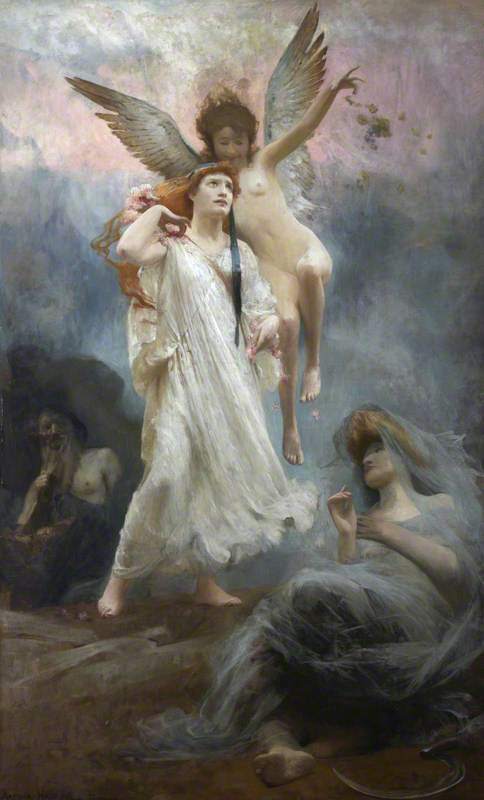 Minthe was one such object of the wrath of Persephone, for the nymph either claimed her superiority to Persephone, or else claimed that she would win the love of Hades. In either case, an angry Persephone (or Demeter) was said to have transformed the nymph into the mint plant. The most famous surviving story of Persephone tells of the descent into the Underworld of the Greek heroes Theseus and Pirithous, for they had vowed to make Persephone the new wife of Pirithous. Some tell of how it was the anger of Persephone, at the impudence of the pair of heroes, which caused Hades to confine Theseus and Pirithous in the Underworld. 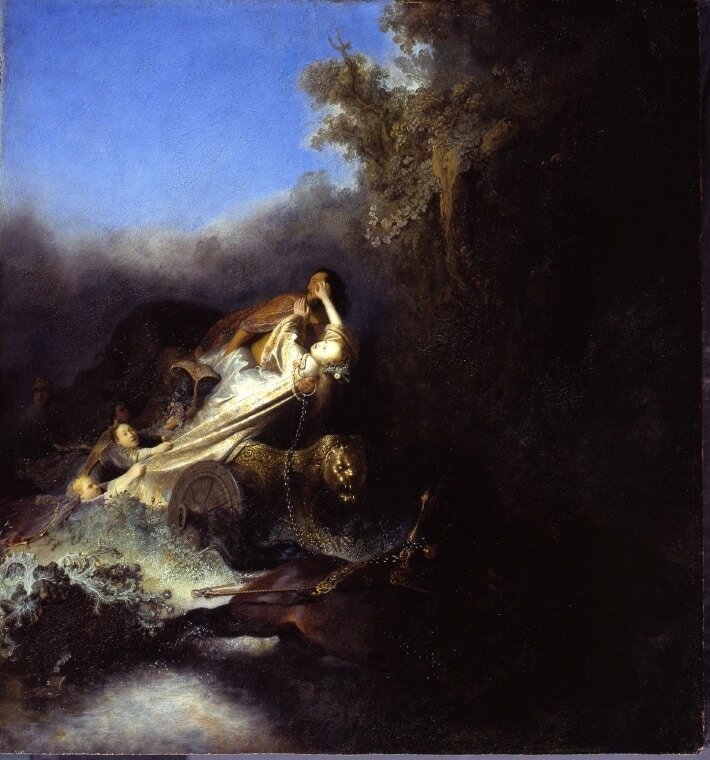 The same tale also shows the benevolence of Persephone for it was also said in some versions of the myth that it was Persephone who agreed that Heracles could release Theseus from his shackles, and it was also Persephone who convinced Hades that Heracles could take Cerberus to the earth’s surface for one of his Labours. Indeed, the benevolence of Persephone is more apparent than her anger in the surviving stories, for it was also Persephone that agreed to let Eurydice leave with her husband Orpheus, when the hero descended into the Underworld. Persephone would also assist Psyche when Aphrodite dispatched the lover of Eros to the Underworld to retrieve some of the beauty cream of Persephone. It was also Persephone who agreed to Sisyphus’ request to return to the world, although of course King Sisyphus was tricking the goddess. Away from the Underworld Persephone also appears in the story of Adonis, for Aphrodite gave the chest containing the infant Adonis to look after. Persephone fell in love with the youth though, and when Aphrodite came to retrieve Adonis, Persephone refused to give him up. ​Zeus had to mediate in the argument, and it was decided that Adonis would spend a third of the year with Persephone, a third of the year with Aphrodite, and a third of the year Adonis was free to choose himself what he did. Adonis would actually spend his third of the year with Aphrodite, in preference to Persephone. In the surviving tales of Persephone based around the Hesiodic and Homeric tradition, it was considered that Persephone had no children, but in the less famous Orphic tradition, it was said that Persephone actually gave birth to several children. The first of these was Zagreus, the first incarnation of the god Dionysus, born to Persephone when Zeus seduced her whilst in the form of a serpent. Zagreus would be killed by the Titans before being reborn to Semele. The same parentage of Persephone and Zeus was also said to have brought forth the underworld goddess, Melinoe. Persephone was also said to have had children with her husband Hades in the Orphic tradition, these children being the Erinyes, the Furies, although in the more common Hesiodic tradition, the Erinyes are considered to have been born to Gaia from the blood of Ouranos.